No fewer than 17 riders showed up for this lovely ride. 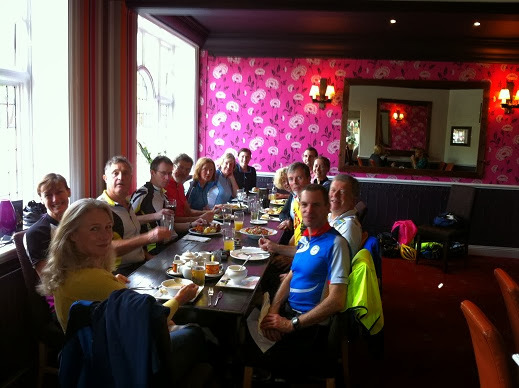 After a short Ride Leader briefing where we reviewed 3 or 4 key elements of our Club’s new Group Riding Guidelines, we suitably split into three groups and off we went for a 37 mile scenic outing. The riders had more than they had bargained for as the journey included a bike wash through a 7 inch deep ford just before the Frensham Pond coffee stop. It was a bit of a challenge to manage such a large group but thanks to some precious tips on the “signposting” technique from Helen Juden and Chris Jeggo, we graduated to a more fluid ride – that was more towards the end, mind you, but we got there! The sun kept us company all day and much laughter could be heard during our “family” lunch at the Devil’s Punchbowl Hotel. 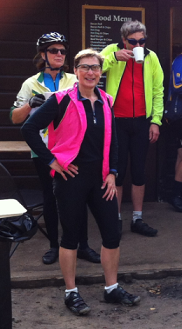 Three new and very fit riders had joined us, Gillian from Guildford, and Clare & Allan Gibson from Godalming. We hope to see you again on our next rides. Meanwhile, Peter, a big “job well done” to you for having built up such a lovely group over the years! (By Louise Gagnon). 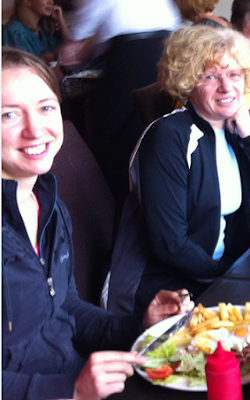 Clare Gibson and Helen Juden; the growing presence of ladies on our rides is so refreshing. Louise Gagnon, our Ride Leader for the day (replacing Peter Fennermore). 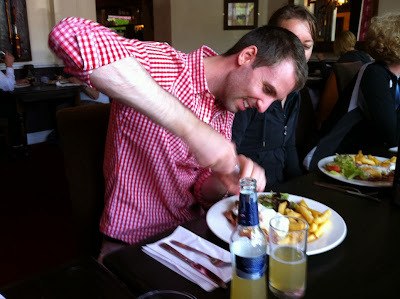 Alan Gibson, fighting it out with the salt shaker as Clare looks on. 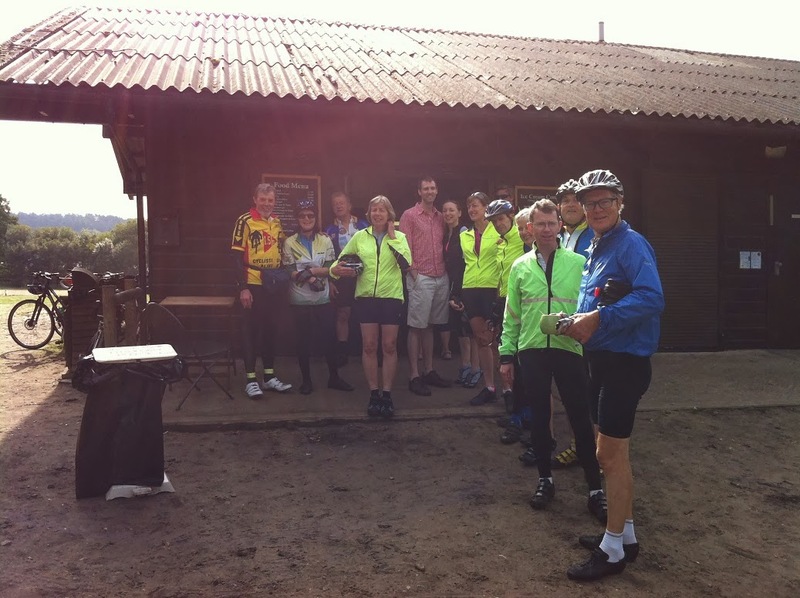 Thirteen of the seventeen riders having a hot brew at Frensham Pond.